Packaging Details Height Width Depth Weight 4.45" 2.3" 2.35" 0.31 oz. Details Dietary supplement. 5x Faster fat loss than diet and exercise alone. Patent pending. Powdered by AXE. Carbolin 19. (This product is not intended to diagnose, treat, cure or prevent any disease.) 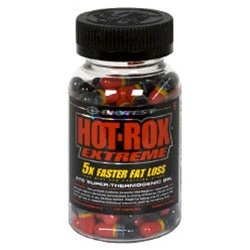 Nutrition Facts Serving Size 1 capsule Servings Per Container 110 Amount Per Serving % Daily Value Hot-Rox Extreme Formula 500 mg *percent Daily Values are based on a 2,000 calorie diet. Ingredients: Hot-ox Extreme Formula: A7-E Super Thermogenic Gel XXX500 (Lauroyl MacroGol-32 Glycerides, P-Methylcarbonylethylphenol, 3,17-Dihydroxydelta-5-Etiocholane-7-One Diethylcarbonate, Carbolin 19 [Forskolin 1, 9-Carbonate], Piperine, Yohimbine HCl), Caffeine. Other Ingredients: Lauroyl Macrogol-32 Glycerides, Gelatin, FD&C Red No. 40, FD&C Yellow No. 6, Titanium Dioxide. *These statements have not been evaluated by the Food and Drug Administration. This product is not intended to diagnose, treat, cure or prevent any disease. Directions As a dietary supplement, take one or two capsules two times per day, each time on an empty stomach with 8 oz of water, allowing at least 6 hours between doses. If you haven't used this supplement previously, begin by taking one capsule two times per day for the first day. Afterward, increase dose to tolerance. Do not exceed four capsules in any 24-hour period. For best results, use continuously for a minimum of one month. Store away from heat, light and moisture.